Much of building a home business online is generating traffic to your website. You don’t want to have that effort be for nothing by having a disorganized and unappealing website that turns visitors away. Fortunately, there are easy fixes so that visitors can find what they want and have a great experience on your website. Get rid of over-the-top flashy advertising that can be gaudy or distract visitors. 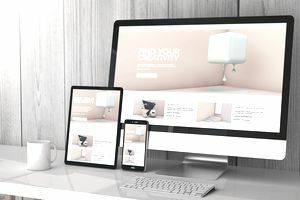 Focus your above-the-fold (the area readers see without having to scroll) content on the key most important elements of your website, such as your email or newsletter sign up. Some tips that can help speed up your site include using jpg instead of png graphics, compressing graphics, and use caching. Visitors come to your website because of something they want or need. If your site is focused on you, they might not be able to see the value of what you offer. Make sure your content is centered on the benefits readers will get. To do that, you have to translate what is so great about what you offer into why it’s so great for your reader. Make sure everything from your About Me page, to your content, product/service listings, and even FAQ or help pages are benefits-focused. Call-to-actions aren’t limited to sales. They can be used to get readers to engage with you by leaving a comment or following you on social media, sign up for your newsletter and more. As you create your pages, think about what you want your reader to benefit from and what you want them to do when they finish reading it. Then provide a call to action so they know the next step. Clearing out the clutter (#1) is one part of making the site easy for visitors to use. Another part is making it easy for them to do what they want to do. If they're looking for your article, is it easy to find or is it hidden behind popups and interspersed with ads? If they want to follow you on Twitter, is your Twitter info on every page or do they have to hunt for it? If they want to email you, is your contact page easily found? If they want to buy, are the purchase instructions and processes easy to follow? This all sounds like a no-brainer, but you’d be surprised at how many websites aren’t very good at making it easy for readers to do what they came to do. Share your experience. Not only do you want people to know you’re real through your experience, but also, you want to provide proof that your experiences are real. For example, if you’ve lost weight from your fitness experience, share your before and after pictures. All the most successful online entrepreneurs have an email list. This allows them to stay in touch with readers to bring them back to the information on the website, share exclusive news and updates, and make offers. The list is crucial, and therefore, its sign up box should be on every page. You can also use a service such as HelloBar to create a signup form that appears in a variety of spots on your site, such as at the top of the page. To encourage sign ups, have a great free offer with your sign up form. Also, consider having content upgrade on certain topics related to what's on your website.